In older versions of WordPress, creating a login form on a page was a complex process for the average site owner. One had to rely on page templates and know how to properly handle forms with PHP. It wasn’t a lot of fun. 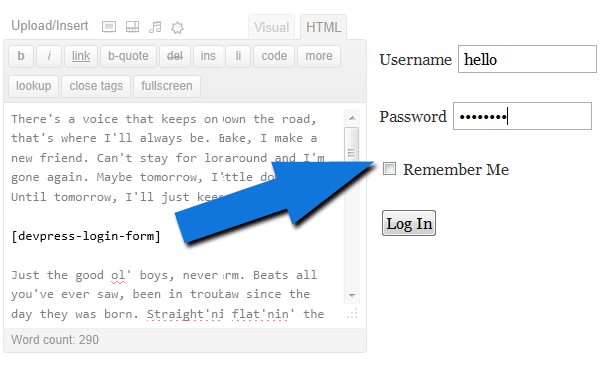 Fortunately, WordPress eventually introduced the wp_login_form() function, which allows you to easily display a login form anywhere on your site. Couple that with a custom shortcode and you have a recipe for some awesomeness. This tutorial will walk you through the steps required for creating a login form shortcode to use in any shortcode-ready area (e.g., your post/page editor). The first step is opening either your theme’s functions.php file or, preferrably, a custom plugin file. You’ll want to use the following PHP code to create a function that registers shortcodes. What the above code does is add your shortcodes registration function to the init hook. It then calls the WordPress function add_shortcode(), which creates a new shortcode called [my-login-form]. Before the [my-login-form] shortcode will work, you need to create the callback function that outputs the login form. The following code does this. The above code checks if the current user is logged into the site. If not, it calls wp_login_form(), which returns the WordPress login form for display on the page. As far as most shortcodes go, this one is actually fairly simple. That’s all you have to do to create a login form shortcode. You would use the shortcode just like you’d use any other shortcode. You can put it within your post or page editor. Or, if you have any other shortcode-aware areas, feel free to add it to one of those. Add the following code to your page editor and save. The following part of the tutorial is only for people who want to take their login form shortcode to the next level. None of these tips are required. Shortcode parameters are outside the scope of this tutorial, so I won’t cover them in complete detail. This subject is covered in the shortcode API documentation. However, I will show you an example of adding in customizable “Username” and “Password” labels. Your shortcode function would look like the following code. Suppose you wanted to change the “Username” text to read “Enter Username” and the “Password” text to read “Enter Password.” You’d use the following in your post editor. In the screenshot of the shortcode in action earlier in the tutorial, you’ll notice that it doesn’t look too fancy. WordPress generates a few CSS classes that you can use to customize the design of your login form. You can also define custom IDs for use in your CSS. These can be defined as arguments for the wp_login_form() function.